The UK internet audience will see slow growth in 2017, climbing 2.4%. 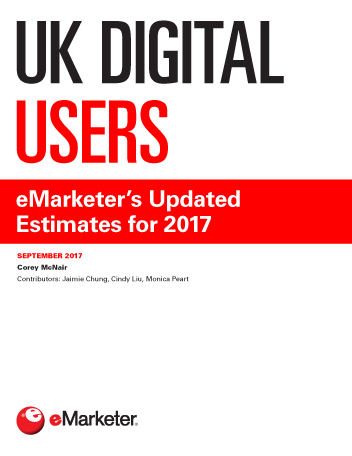 eMarketer has slightly increased its projection for the overall number of UK internet users throughout the forecast period, based on data showing higher-than-expected usage among those ages 45 and older. There will be 42.5 million UK smartphone users this year. While gains will continue to slow through 2021, two-thirds of the UK’s population will own a smartphone by 2019. A majority of growth will come from older people upgrading their features phones, encouraged by affordable models, improved device functionality and larger screens. At least 35.6 million people, or more than half of the UK population, will use a tablet at least monthly in 2017. But growth is leveling off: The UK’s tablet audience will increase just 3.1% this year and slow throughout the forecast. Social networking is one of the most popular digital activities in the UK. More than two-thirds (67.1%) of internet users will sign in to a social network this year. Facebook will be the most widely used platform, with 88.3% of social networkers and 59.2% of internet users accessing it. Instagram and Snapchat continue to grow quickly in the UK. Instagram’s user growth will outpace Snapchat’s, increasing 34.8% to 16.7 million users in 2017, while the latter will jump 20.2% to total 14.0 million. "Nearly 7.5 million people, or 13.7% of UK internet users, will go online solely via mobile device in 2017. As internet users become more dependent on mobile devices, this figure will rise to nearly 10 million by 2021."